Jagadish, N. et al. "A-kinase anchor protein 4 (AKAP4) a promising therapeutic target of colorectal cancer." Journal of Experimental & Clinical Cancer Research 1:142 (2015). PubMed: 26590805. Application: Cell culture. Jagadish, N et al. "A-kinase anchor protein 4 (AKAP4) a promising therapeutic target of colorectal cancer." J Exp Clin Cancer Res 34(1):142 (2015). DOI: 10.1186/s13046-015-0258-y. PubMed: 26590805. Application: Cell Culture. Saha, A et al. "Effect of Metformin, Rapamycin, and Their Combination on Growth and Progression of Prostate Tumors in HiMyc Mice.." Cancer Prev Res (Phila) 8(7):597-606 (2015). DOI: 10.1158/1940-6207.CAPR-15-0014. PubMed: 25908508. Application: Cell Culture. Koh, JH et al. "Effect of water-soluble fraction of cherry tomatoes on the adhesion of probiotics and Salmonella to intestinal epithelial cells." J Sci Food Agric : (2013). PubMed: 23749725. Application: Cell Culture. Mycoplasma contamination is one of the most challenging problem of daily cell culture. Commonly used antibiotics in cell culture are not effective against mycoplasma contamination. Mycoplasma can damage precious cell lines by inducing cellular changes, such as chromosome aberrations, changes in cell morphology and cell growth. For this reason,scientists at abm have developed qPCR-based assay for mycoplasma contamination(PCR Mycoplasma Detection Kit (G238)) and Mycoplasma Elimination Cocktail (Mycoaway). Compared to similar products on the market, our Mycoaway is much more potent that can eliminate over 50 different species of mycoplama contamination with only 4 treatment. In addition, the drug showed no toxicity to any cell under treatment as determent by gene array assay. change to routine cell culture methods needed. -effectively eliminates over 70 types of mycoplasma species – broad range. -not cytotoxic to most mammalian cell lines. -eliminates mycoplasma in less than 2 weeks (4 cell passages). -ready-to-use primer mix — reduces variability. -able to detect numerous mycoplasma species – high sensitivity. -included positive control to verify negative results. -rapid results in 2 hours. Tigecycline A glycylglycine type of antibiotic derived from tetracycline. Inhibits protein translation in bacteria by binding to the 30S ribosomal subunit and blocking entry of amino-acyl tRNA molecules into the A site of the ribosome. This prevents incorporation of amino acid residues into elongating peptide chains. 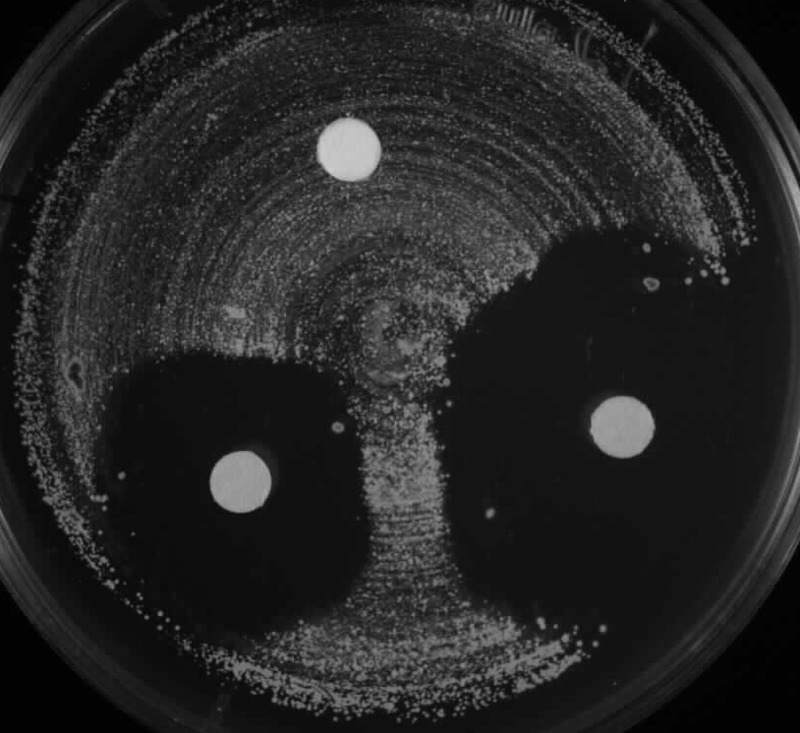 Bacterial contamination is often associated with long-term culture of primary cells, stable cell lines, and stem cells. It is often frustrating that cells got contaminated after weeks or months of clone selection or precious establishment of primary cells. Most antibiotics like Ampicillin and others found in most labs can not solve the problems, leading to loss of precious cells. To this end, scientists at ABM have successfully developed a new formulation of antibiotics that can kill any bacteria associated with cell culture. The reagent is so effective that you will once-for-all worry-free when culturing precious cells. This product is stored at -20°C , and is stable for 60 months if properly stored. Avoid freeze-thaw cycles by making aliquots upon first thawing this product. Prepare 1. treatment medium by adding BacAway to sterile cell culture me­dium in a 1:250 dilution. Wash contaminated cells three times using sterile medium.2. Add3. treatment medium to the cell culture. Replace with new treament me­dium after 3 hours and 7 hours. After incubating the cell culture overnight, visually examine the medium. If 4. bacteria are still visible under the microscope, continue to 5. If not, continue to 7. Trypsinize and centrifuge the cells. Carefully discard the supernatant, then 5. re-seed the cells in a new culture vessel containing treatment medium. Incubate the cells for 6-7 hours, then replace the medium with new 6. treatment medium. After incubating overnight, replace the medium with new 7. treatment medium once per day for one week. This will completely eliminate any remaining bacteria. Mycoplasma contamination is one of the most challenging problem of daily cell culture. Commonly used antibiotics in cell culture are not effective against mycoplasma contamination. Mycoplasma can damage precious cell lines by inducing cellular changes, such as chromosome aberrations, changes in cell morphology and cell growth. For this reason, scientists at abm have developed qPCR-based assay for mycoplasma contamination (PCR Mycoplasma Detection Kit (G238)) and Mycoplasma Elimination Cocktail (Mycoaway). Compared to similar products on the market, our Mycoaway is much more potent that can eliminate over 50 different species of mycoplama contamination with only 4 treatment. In addition, the drug showed no toxicity to any cell under treatment as determent by gene array assay. -direct addition of cocktail to cell culture medium – no change to routine cell culture methods needed. 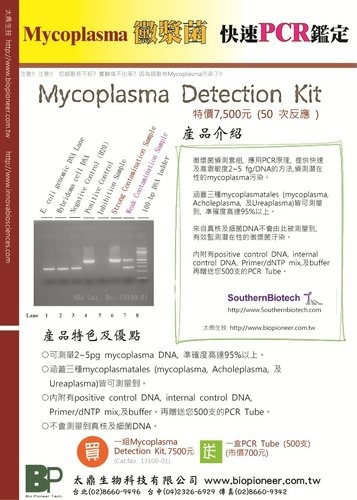 Mycoplasma contamination detection and mycoplasma elimination customer service are also provided, please refer to the Mycoplasma Detection and Elimination Service page for details. i. Trypsinize cells of 80- 90% confluency and check for complete detachment. ii. Centrifuge cells at 1500rpm for 10mins. Discard the supernatant, then resuspend cells using appropriate amount of complete culture medium. Make sure to break all visible cell clumps. i. Prepare cell suspension using usual method to a cell density of 1X 106 cells/ml in complete culture medium. 2. Add Mycoplasma Elimination Cocktail at a 1:1000 dilution (1μl of cocktail per 1ml of medium) to cell suspension from step 1.a.ii. or 1.b.i. and mix carefully. 3. Transfer the mixture from step 2 to a sterile culture dish and incubate at usual conditions for 3 days. 4. Repeat steps 1-3 for 3 more times or 4 cell passages. The culture should be mycoplasma free after the final treatment. 5. Confirm the success of mycoplasma elimination using the Mycoplasma PCR Detection Kit (Cat No. G238). • Two weeks after treatment, test the cell culture for mycoplasma using the Mycoplasma PCR Detection Kit (Cat No. G238) to ensure that fresh infections do not arise. • Discard all media used for contaminated cell cultures. Use fresh media in order to prevent future mycoplasma infections due to contaminated media. -direct addition of cell culture supernatant to PCR reaction — no DNA isolation/purification steps required. -able to detect over 70 types of mycoplasma species – high sensitivity. Daniella C. Bartholomeu et al., J. Immunol., Jul 2008; 181: 1333 - 1344. Mycoplasma detection is often difficult due to its lack of visable appearance, therefore it can be afflicting your valuable cell and affecting your results without your knowledge. Cells contaminated by mycoplasma species can have changes in proliferation, metabolism, gene synthesis and processing, and even adhersion properties. The solution for quick and easy mycoplasma detection is ABM's PCR Mycoplasma Detection Kit. The PCR Mycoplasma Detection Kit allows for fast and reliable identification of mycoplasma contamination in cell cultures. Mycoplasma DNA in the cell culture supernatant is amplified via PCR and visualized using gel electrophoresis. In addition to the short detection process (less than 2 hours), the easy handling and high sensitivity makes this PCR Mycoplasma Detection Kit a convenient tool for routine examination of cell cultures and media.